Killer tornadoes, earthquakes, sinkholes, tsunamis, and all manner of scary stuff happening lately. Manmade toxins are killing all the bees, which could have serious repercussions. It’s looking a little apocalyptic out there! So it makes sense that futuristic dystopian movies are following on the heels of all these environmental and manmade disasters. 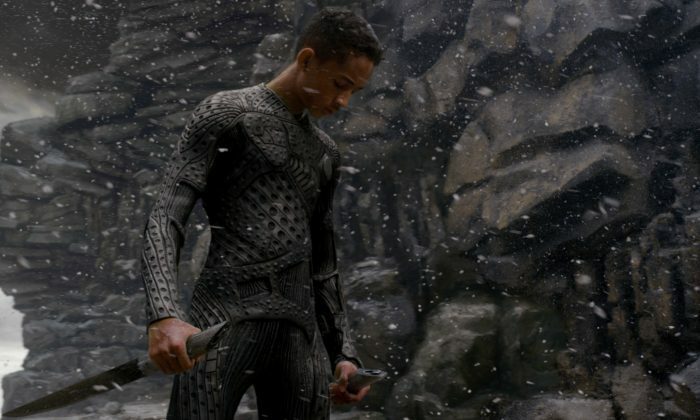 The latest lukewarm offering is M. Night Shyamalan’s “After Earth,” starring summertime blockbuster stalwart Will Smith. Like “Oblivion” before it, this film says, “We humans messed up,” but offers a meager portion of entertainment and nothing in terms of solutions. Per the usual apocalyptic storyline, humanity messes up everything and has to get out of Dodge, in this case skedaddling to an exoplanet called Nova Prime, which is very, very far from here. Everything on planet Earth then goes about evolving deadly abilities to annihilate humans. Hold on a minute—if there are no humans, how does that happen? That’s not even Darwinian, and some say that he didn’t get it right either. The pseudo-science really ought not to insult the audience’s intelligence. But let’s not get ahead of ourselves; we’re still in synopsis mode. Smith plays General Cypher Raige, who runs the Ranger Corps, a militaristic peacekeeping unit. Will’s real-life son Jaden plays Raige’s son Kitai, who struggles to grow out from under dad’s long shadow. They both go on a mission to Earth. The stingray-like spaceship gets pelted in an asteroid field and lands rather badly. Everyone except our hero and his kid is killed, but the two get dinged up pretty good. Their survival mission is to go get an emergency beacon out of the ship’s tail, which broke off and landed who knows where. As mentioned, lethal species abound, plus one of M. Night Shyamalan’s standard alien thingies that runs amuck. Jaden Smith is a fine-looking young man. He could use a little more practice in the enunciation department. Also acting. So far he’s learned three expressions: quizzical, sad, and sad-quizzical. And then there’s rage, but it looks like the other three, except louder. He’ll be a fine actor someday, just like his major movie-star dad. There’s more intelligence-insulting pseudo-science, like Earth freezing into ice-age mode overnight and then having lush green vegetation the next morning. Has no one seen the ravages of frost on a vegetable garden? There’s some really bad baboon, buzzard, pig, leech, and lion CGI. There’s a nice cliff dive like the one in “Avatar.” Mostly there’s nothing new to see here. At the end, Jaden’s character quips, “Dad, I wanna work with mom.” Will’s character replies, “Me too.” If they’re talking about Jada Pinkett Smith, that’s maybe a good idea. Somebody call Quentin Tarantino to direct. That’d be lively. Apocalyptic, even.